SHANKHNAD.ORG: USA was wrong about Allepo,Syria-There is ONLY military solution for terrorist. USA was wrong about Allepo,Syria-There is ONLY military solution for terrorist. The USA says there could be no military solution to Syria. The Russians may be proving the United States wrong. There may be a military solution, one senior American official conceded Wednesday, “just not our solution,” but that of President Vladimir V. Putin of Russia. Terrorist learns only their own language- military extermination and in past and present it proves. USA is playing game in Syria with elected government for Saudi Wahabi regime, seems like Saudi has bought USA'S ARAB FOREIGN POLICY but they were not aware of fact that Russia will not leave any stone unearthed if it comes to its friends- IRAN,INDIA, SYRIA etc. The Russian military action has changed the shape of a conflict that had effectively been stalemated for years. Suddenly, Mr. Assad and his allies have momentum, and the United States-backed rebels are on the run. 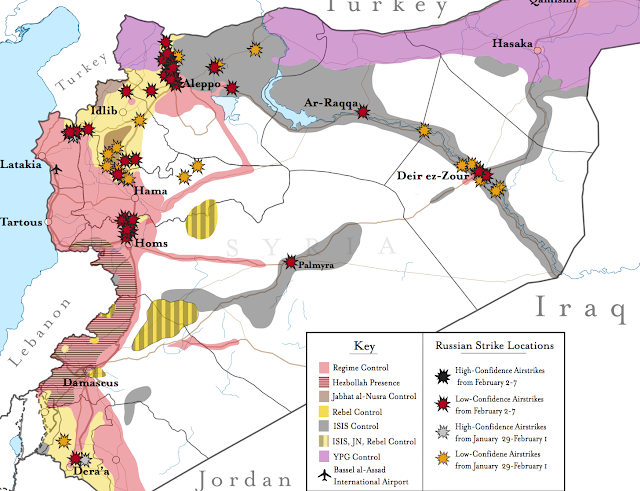 If a cease-fire is negotiated here, it will probably come at a moment when Mr. Assad holds more territory, and more sway, than since the outbreak of the uprisings in 2011. Mr. Kerry enters the negotiations with very little leverage: The Russians have cut off many of the pathways the C.I.A. has been using for a not-very-secret effort to arm rebel groups, according to several current and former officials. Mr. Kerry’s supporters inside the administration say he has been increasingly frustrated by the low level of American military activity, which he views as essential to bolstering his negotiation effort. At the core of the American strategic dilemma is that the Russian military adventure, which Mr. Obama dismissed last year as ill-thought-out muscle flexing, has been surprising effective in helping Mr. Assad reclaim the central cities he needs to hold power, at least in a rump-state version of Syria. Battle maps from the Institute for the Study of War show, in fact, that it is: The Russians, with Iranian help on the ground, appear to be handing Mr. Assad enough key cities that his government can hang on. Days of intense bombing that could soon put the critical city of Aleppo back into the hands of Syrian President Assad’s forces.